The secret to pain free squatting – 5 tips to save your knees! The squat is one of the most fundamental movements that can be performed at the gym. When performed correctly the squat has great benefits that can be carried over into everyday activities. However, there are common faults within the squat that can lead to injuries in different joints. Knee pain during or after a squat is a common complaint we have in the clinic. Usually the issue involves poor movement patterns leading to acute as well as long term injuries. Not every patient is the same although there are certain typical patterns that can lead to knee pain that can be resolved by applying the following principles. We need to start by looking at the foot and ankle, it is essential to have appropriate range of motion around the ankle joint. During a deep squat (below 90 degrees with heels on the ground) the ankle needs quite a large amount of dorsiflexion (foot moving towards head). Generally people with a history of ankle sprains will have poor dorsiflexion and usually compensate with the knee travelling inwards placing a large amount of stress on the inside of the knee. 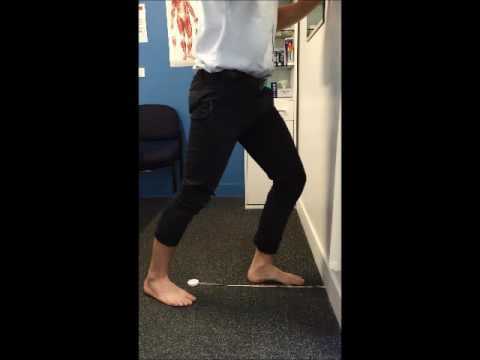 The knee-to-wall is one of the easiest ways to test ankle dorsiflexion range of motion. Place the end of a tape measure (or ruler) against a wall. Start with the top of your toes against the wall keeping the hips and trunk square. Place the other foot slightly behind the body. While trying to keep your heel on the ground move the knee over your toes and touch the wall. Move further back until you cannot keep the heel on the ground. Kasayma et al found that subjects who scored 11cm or more on the test were able to perform a deep squat. Scoring less than 11cm means there’s room for improvement. One of the best ways to increase dorsiflexion is to perform the movement and push it into and past the end of available range. Using a large resistance band, tie it to a table or chair (may need to place heavy objects onto table/chair). Step into the loop of the band and place it just under the malleoli (bony bits that stick out either side of the ankle). Step away from the table until you feel the band pulling you back. Adopt a stride position, keep you heel on the ground and move the knee over the toes before the heel is about to lift (this is your end of range). At the end of range oscillate (small millimetre type movement) the knee over the toes using your hands and body weight. Continue for 60 seconds and repeat 3 times. Poor foot stability can also lead to knee problems, generally people who pronate (arch of foot collapsing inwards) will move their knees into a genu valgus position (knee travelling inwards). Under load and tension this position can promote knee pain. The best way to analyse whether pronation is an issue is to see your All Care physiotherapist, based off assessment they will determine whether poor foot stability is the underlying cause. Looking higher at the hips, it is imperative that there is enough strength in the hip external rotators and abductors (glutes) to keep the knees from travelling inwards. To resolve this it may be as simple as cuing yourself to slightly push the knees outside the line of the ankle/foot while squatting. However the underlying issue of hip strength will still need to be addressed. If you are still experiencing knee pain with a squat it may be best to strengthen the hip external rotators and abductors in an unloaded position. A great way to start in an unloaded position is to perform the clam exercise. Lying on your side, bend the knees up so your feet are in line with your bottom. Keeping your feet and ankles together lift the top knee off the bottom knee and ensure the hips don’t roll backwards. Once you can perform 3 sets of 15 repetitions without losing form place a theraband around the top of the knees for added resistance. Next is to progress the clam exercise into a squat exercise. If you have had a sore knee then let it settle down under the guidance of your All Care Physiotherapist. 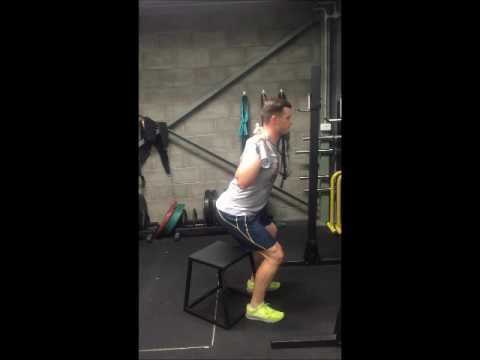 It is essential we teach the body safe biomechanics while performing the squat. In standing with feet and knees together tie a theraband around the top of your knees (this will need to be quite tight). Place your feet shoulder with apart and you will start to feel the tension of the band wanting to pull the knees inwards. Push the knees out against the band and perform the squat. The band gives a tactile cue to ensure the hips move into external rotation, whilst promoting use of the hip abductors, avoiding the knee valgus position while also gaining a deeper squat. A majority of people spend most of their day in front of computers which can lead to tight hip flexors, adductors and loss of external rotation around the hips. This combination can cause the knees to come into valgus; again placing increased stressed through the inside of the knee, as well as decreasing the depth in a squat. Therefore it is important to mobilise the hips to gain more range through the adductors, hip flexors and external rotators. The frog stretch stretches and mobilises these areas quite well while in an unloaded position. On the ground, come into a 4 point kneel position with your hands under your shoulders and your knees slightly behind the hips and slightly outside the hips. Gently move backwards as if you were going to sit onto your heels. Hold this position for 30 seconds and repeat 4 times. Overloading your joints when you don’t have the strength or flexibility to complete a loaded full squat has potential for injury. Work on the four tips above and progress the depth of your squatting to get the most out of the squat and minimise injury. Below are our suggestions on how to progress to a full squat. Once you are able to tolerate loaded knee flexion (or bend) with the shins vertical, a deadlift (see our deadlift article on proper set up and performance) is a great way to keep up the strengthening of the glutes without going into too much knee flexion. As the pain free knee flexion range improves it is possible to progress onto box squats, moving closer to a loaded back squat. The box squat is a great way to reduce the angle of knee flexion, keeping the knee in a pain free range while also reducing the amount the knee has to travel forward. Depending on where the knee is painful will determine how high or low the box is. Set the box/stool up behind the squat rack, de-rack the bar walk back so that your feet are almost up against the box. Squat down until you are sitting on the box (the shins should remain relatively vertical) pause for 1-3secs, this removes the use of the stretch shortening cycle concentrating on glute power and development, drive the heels into the ground push the knees slightly outside the ankles and drive the hips through until you are vertical again. Once you are sitting on the box it is imperative to keep your foot positioning the same, moving them behind or in front will change the angle of knee flexion either causing pain or making it difficult to perform the squat. For sets, repetitions and weight progressions consult with your All Care physio.